by MAURICE PHILIPPS ====================== I HAVE SOME SECRETS FOR YOU is a Blog made to share unknown, exclusive information about secret history. Here, I'll try to transmit documented information that are the result of serious research. My objective will always be to critic accepted perceptions and opinions about current events, politics and history, recent or old. And thus, in each post, to unveil some secrets for you. On this Sunday, I can't resist a temptation that have nothing to do with sin. Before going further, I want to reassert my firm belief in the importance of logic and objectivity, more specifically of “journalistic objectivity”. As much as I can, that is as much that I’m self-conscious about that, my research of information, and ultimately my quest for truth, will always been conducted with the greatest objectivity, with respect for reality. Sure, there is a great debate about what is objectivity. In a few simple words, objectivity is for me (and that in itself is subjectivity) the search of “objects” –of facts, and an effort to verify and validate their reality. Subjectivity being the interpretation of those facts, the elaboration of opinions and, worse of all, the invention of conclusions that are pseudo-facts based on facts that were either not validated or wrongly interpreted. I don’t want to go too far on this objectivity/subjectivity discussion but I want to make clear that I don’t consider those two terms as white and black, good and bad. Subjectivity is a quality that should be cultivated, it is per se creativity. But it is not what one should express in a courtroom. In journalism or historical research, subjectivity should be put at the service of objectivity. It is the creative force that will allow an author to find out new trails to investigate, new places where to be objective. The secret here is to be self-aware and to be able to know when own use subjectivity. All of that just to tell you, very objectively that, in the next lines, I will be subjective but that it shouldn’t be my usual style. So, on this Sunday, I want to share with you an interesting finding that tends me to believe that everything in this world is part of a bigger picture; that even events that we may consider as tragedies or crimes are parts of a plan. It was not my intention but, writing those lines, I’m just finding out that what will follow can be of great help for people who are affected or disturbed by events such as the JFK, RFK and MLK assassinations. Too often, people, who start to consider that secret power and “conspiracy” are ruling our highest political world, are deeply troubled and even fall in depression. The idea that those conspiracies are small parts of a bigger picture may be of comfort for many, because it tends to credit the belief that there is a higher reality greater than the “highest political world”. So here is the story I want to share. Years ago, after I had spend a lot of time on reading about and researching the JFK assassination, a friend told me he had heard something about prophecy that were hidden in the Bible and that were supposed to be related to the present time. This short description made me think of the Bible Code. I have read a little about it and wasn’t giving a lot of credence to what seems to be an “after the fact” interpretation. It seems to me that if you choose any historical event then search in all the Bible for something that seems to relate to it, the probability was very high that you may find something that sounds alike. But my friend told me he knew about the Bible Code but was referring to something else. What he did heard was quite more specific. According to some source, the Psalms were prophecies for the twentieth century and beyond. Beginning at the year 1900, every of the 150 Psalms was related to one of the last years before the end of times; i.e. : Psalm 1 was about year 1901, Psalm 2 on year 1902 and so on. 63:1 God, you are my God. and aim their arrows, deadly words, (…) to shoot innocent men from ambushes.” Well, my friend and I were astonished. Were those words written about 1963 and the JFK assassination? It may be wrong to give a definitive answer to that question, one way or another. But it will be worse not to even ask ourselves the question. In the presentation of this Blog, I have wrote that I had the intention to transmit in it exclusive new information that are the result of serious research. The items that I have recently posted and that were reproduced from my book, De Dallas à Montréal, enter in this category, but they are only a fraction of the secrets I want to share with you. In the next weeks, I intend to post other articles that will contain new exclusive info. Here are a preview of the subjects to come. 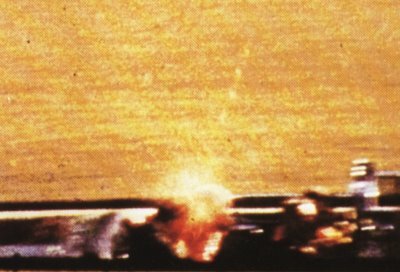 The Zapruder film constitutes the best proof of the course of events of the JFK assassination. Image 313 of this film is most difficult to support because it clearly shows the president cranium explode under the impact of a projectile. But, more than one macabre image, frame 313 comprises a detail which stayed unperceived for more than forty years: the photographic imprint of the fatal projectile - the ultimate proof of the plot -. ARE CANADA NATIONAL ARCHIVES HIDING THE KEY OF THE JFK MYSTERY? 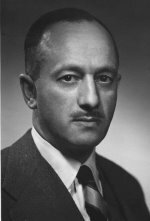 OSS veteran, Louis-Mortimer Bloomfield is perceived by some as the architect of the assassination plot against President John F. Kennedy. Before its death, this Montreal lawyer donated his personal papers to Canada National Archives, under condition that they are made public twenty years after his death. However, more than one year after the end of this delay, Library and Archives Canada refuses to make available the Bloomfield documents. Will a legal battle carry out revelation of new information on the JFK assassination? Documents obtained from the US National Archives report that Lee Harvey Oswald have been seen in Montreal a few months before the JFK assassination. In those documents, he was said to have distributed Fair Play for Cuba leaflets on a Montreal street corner that now host Montreal’s World Trade Center. For the first time, the picture of the woman that was with him in Montreal will be made available here. Just out of FBI archives, a 1942 report reveals an astonishing bond between Leon Trotsky and baron de Rothschild. Was the communist intellectual an agent of the Rothschild? Even if he was offered a $20,000 bribe, transmitted by high officials of the Canadian government, attorney Pierre Lamontagne, attorney for the US Justice Department, opposed Lucien Rivard’s bail. After John F. Kennedy assassination, Mafia boss Joe Bonanno (right) preferred to be incarcerated in Montreal instead of being extradited to the United States. Rivard’s lawyer, Raymond Daoust (left) was also representing Bonanno and made simultaneous solicitations for him to the Canadian Immigration minister and to attorney Pierre Lamontagne. At the beginning of the 1960’s, William Obront was only known as a meat industry millionaire and was maintaining close contacts with associate Canadian Defense secretary Pierre Sevigny. In the 1970’s, CECO (a Quebec official inquiry on Organized Crime) identified him as the financial manager of the Cotroni family. Exiled to Costa-Rica, he met numerous times Norman LeBlanc, a man supposed to have discussed the buying of a gun “good to kill Kennedy” in New Orleans, in 1963. On October 10 1963, US Customs Agents at Laredo, Texas arrested Lucien Rivard’s courrier and make the second most important seizure of narcotics of the time. The heroin was coming from Mexico and was furnished by Paul Mondolini, a Santos Trafficante associate and a relation of French agent Michel-Victor Mertz that was expelled from Dallas the day after John F. Kennedy assassination. 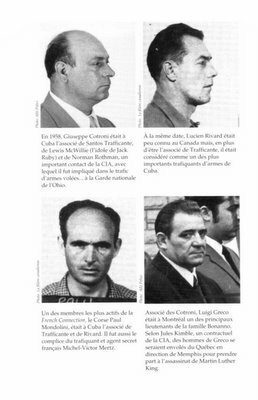 Eight months later, in June 1964, after Attorney General Robert F. Kennedy gave order to start extradition process against them, Lucien Rivard and his accomplices Julien Gagnon, Raymond Jones and Charles-Emile Groleau were arrested in Canada. 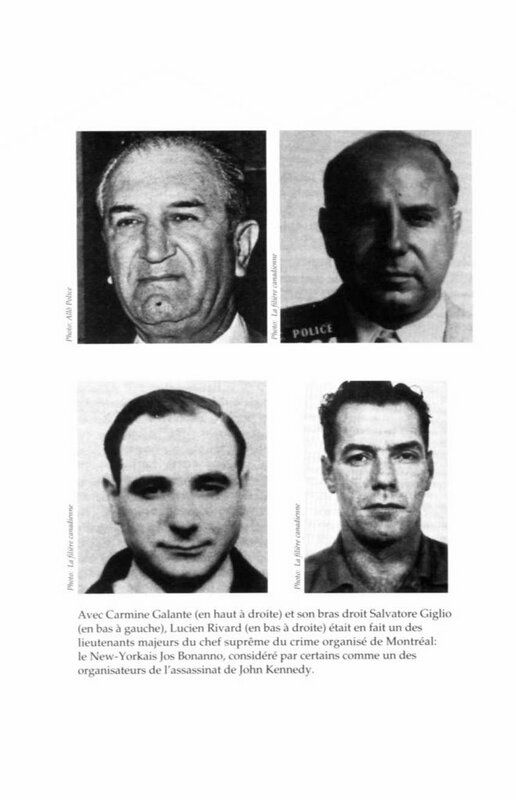 With Carmine Galante (above right) and his right hand man Salvatore Giglio (down left) Lucien Rivard ( down right) was in fact one of the top lieutenant of Jos Bonanno, the supreme chief of Montreal organized crime, that was seen by some as one of the planners of the JFK assassination. In 1958, in Cuba Giuseppe Cotroni was associate to Santos Trafficante, to Lewis McWillie (Jack Ruby’s idol) and to Norman Rothman, an important CIA contact, with whom he participated in smuggling stolen arms.. from Ohio National Guard. At the same time, Lucien Rivard was little known in Canada but, in addition to being Trafficante’s associate, was seen as one of Cuba top arms smugglers. One of most active members of the French Connection, Corsican Paul Mondolini was in Cuba associate to both trafficante and Rivard. He also was accomplice of French smuggler and secret agent Michel-Victor Mertz. Cotroni’s associate Luigi Greco was in Montreal one of Bonanno family top lieutenant. According to Jules Kimble, a CIA contract agent, Greco’s men did fly from Québec to Memphis to take part in Martin Luther King assassination. Caron leaves immediately and enters Mexico on September 31. On October 2, like a simple tourist, he arrives in Mexico City, just as another visitor, Lee Harvey Oswald, is also in the city on a blindfold mission. Oswald leaves Mexico City on October 3. Caron, who has confided his car to some unknown peoples who have the task to hide something in it, innocently visited the city until October 9. On October 10 1963, at the Mexico-United States border, the U.S. Customs officers search Caron's car and, by luck, discover 35 kilograms of heroine. At a market price of one million dollars a kilogram, this 35 millions seizure is the second most important of U.S. history. Submitted to a persuasive interrogatory, and confident that he, his wife and his four children will be protected, Caron starts to confess. First, Caron denounces his Quebec's accomplices and, finally, their chief, the recipient of the merchandise, Lucien Rivard himself. Though he doesn't know their complete names, he finally identifies on photographs the Mexico City's suppliers. Thus he incriminates the Corsican Paul Mondolini, partner of Santos Trafficante and Michel-Victor Mertz, and considered as Mexico City heroin's king; Jorge Edouardo Moreno Chauvet, Mexico most important narcotics trafficker; Fulgentio Cruz Bonet, a Cuban exile; and Mafiosis Tony Farina and Frank Giovani Scalici, members of Carlo Gambino's New York's family, the most powerful chief of the U.S. Cosa Nostra. Even if they didn't understand all the implications of this huge transaction involving such important international Mafia's characters, observers of the Rivard Case noticed that, on view of this file's importance, U.S. Attorney General Robert Kennedy did show personal interest to the case. Maybe his interest was motivated by his knowledge of the network to which participated Rivard. So, the Rivard Case reveals the existence of an important heroin transaction, taking source in Mexico just at the moment when, according to Christian David, three Corsican killers where in Mexico City, in transit toward Dallas. Christian David was the French heroin trafficker that revealed to reporter Steve Rivele that a contract to kill John F. Kennedy was offered to him in Marseille. According to David’s story, he declined any participation in the contract but three Corsican shooters took a part in the assassination and where paid with heroin. In the BBC television series The Men Who Killed Kennedy, Rivele stated that he believe Paul Mondolini was the coordinator of the Corsican shooters. Interestingly enough, the same Paul Mondolini was the source of the heroin that Lucien Rivard tried to import to the United States. The ties linking Rivard to the Trafficante-Ruby network and the Mertz-Mondolini French connection, as well as the synchronism between Oswald's trip, the presence of Corsican assassins in Mexico City and the Rivard Case, had never been exposed anywhere, neither even suggested otherwise that by an obscur allusion to Lucien Rivard in The Plot to Kill the President, a book written by Robert G. Blakey, Chief Counsel of the House Select Committee on Assassination. First of all: a word about my book. Ten years have past since the publication of my essay, DE DALLAS À MONTRÉAL, La filière montréalaise dans l'assassinat de JFK*. Even if it got good reviews and a fair distribution in Quebec, Canada, this book didn't reach the American public neither the JFK assassination researchers community. I’ve never care too much about international publishing success, since I wrote the book in order to humbly share information that were overlook by American writers. But I still think that a few important pieces of the JFK assassination puzzle may be found in Montreal. 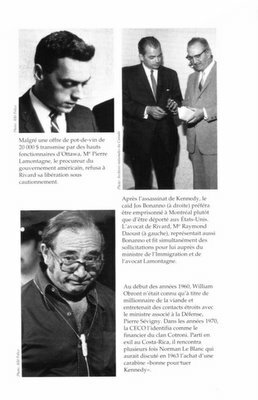 So, De Dallas à Montréal main originality was to show how Dallas’ crime of the century was related to Canada biggest political scandal: the Rivard Case. A complex affair, the Rivard Case started in October 1963 with a massive heroin importation from Mexico to the United States. Its principal actor, Lucien Rivard, a prominent Mafia captain was both a drug and arms smuggler and a financial backer of the Liberal Party of Canada. During the late fifties, in Montreal, Rivard was one of the top officer of Jos Bonanno, the head of an important New York Mafia family. But what is more significant relatively to the JFK assassination is the fact that Rivard was an associate of Santos Trafficante, Jr. in Havana casinos and that he was smuggling arms in Cuba. According to the House Selected Committee on Assassinations, Rivard was one of Castro prisoners for whom Jack Ruby did negotiate in 1959. This fact wasn’t published in HSCA’s report since Rivard’s name was only reproduced in HSCA’s volumes of testimonies. But in 1981, in his book The Plot to Kill the President, G. Robert Blakey, chief counsel of the HSCA, flatly stated that Rivard was one of the prisoners that Jack Ruby tried to get released in 1959. Years after the publication of my book, and after Rivard’s death, his widows confirmed to a Montreal film producer that Rivard indeed was in contact with Ruby. In 1964, after the JFK assassination, Rivard and Bonanno were jailed in Montreal, awaiting extradition to the U.S. Their attorney and high officers of both the Canadian Department of Justice and tthe Immigration Department offered bribe to the lawyer representing the United State in the two extradition cases. The scandal that followed finally forced the resignation of Canada Minister of Justice, Guy Favreau. 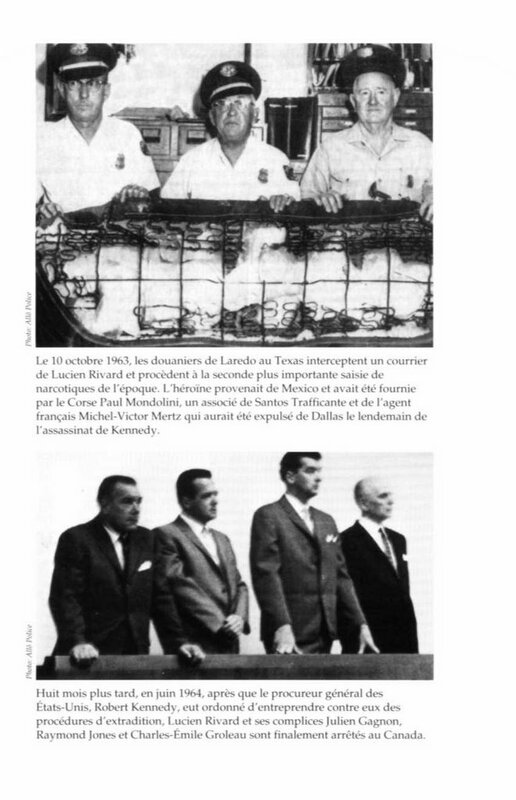 * French title translates as: FROM DALLAS TO MONTREAL, The Montreal Connection in the JFK Assassination. I HAVE SOME SECRETS FOR YOU is a Blog that I want to use to share unknown, often new and exclusive information about secret history. In this Blog, I'll try to transmit documented information that are the result of serious research. My main objective will always be to critic accepted perceptions and opinions about current events, politics and history, recent or old. And thus, in each post, to unveil some secrets to you. As you’ll soon see, I’m quite interested in the JFK assassination. Since 12 years, I spend a lot of time researching it and, humbly, I do believe I have found out a few information about it that should be known by the public. 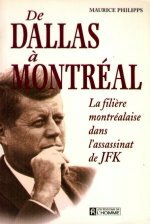 I even wrote and published a book about it: De Dallas à Montréal, la filière montréalaise dans l’assassinat de JFK. Yes, it was in French. I’m am in fact a Québécois –a French Canadian*, for those of you that are not aware that Québec is a Canadian province where French is the majority language (it’s not a big secret, but, for those that didn’t knew that, at least you just learn something new). *Since my first language is French, you shall excuse that my English writing may be less than perfect. On the other hand if you are French speaking or if you’ll like to exercise your French you can write me in Molière’s language.